David Lloyd George, the ‘Welsh wizard’ who became prime minister in 1916 and was subsequently hailed as the ‘man who won the war’, challenged, charmed and mystified the English establishment all his political life. He lived by his wits in both his public and private lives, attracting and fascinating women and loving them in return. For thirty years it was an open secret at Westminster that, in all but the legal sense, he had not one wife but two. His reputation as an incorrigible flirt was part of his mystique: as his son once said, with an attractive woman he was as little to be trusted as a Bengal tiger with a gazelle. In this impressively researched and hugely sympathetic account, based on thousands of original documents and letters, Ffion Hague explores the lives of the women who loved Lloyd George. Margaret Owen, a fellow Welsh-speaker from rural north Wales, married Lloyd George in 1888. She was the mother of his five children and kept him connected to Criccieth, her home and his constituency. She later became the first female JP in Wales and a successful political campaigner in her own right. Frances Stevenson, 23 years Margaret's junior and a non-militant suffragette, became Lloyd George’s secret mistress when he was Chancellor of the Exchequer. She spent thirty years as his political confidante, becoming the first ever female Private Secretary at No. 10, Downing Street. The situation, secret and complex, required delicate juggling and deft manipulation at all times. The respectability Frances craved was hers at last in 1943, but she was to be married for less than two years before he died. Her greatest enemy was Megan, Lloyd George’s youngest daughter and political heir, who became Wales’ first female MP. She never married and never forgave her father’s mistress, pursuing a feud that was to have lasting and tragic consequences. Ffion Hague makes utterly human and absorbing this sensational tale of passion, loyalty, infidelity and duty. 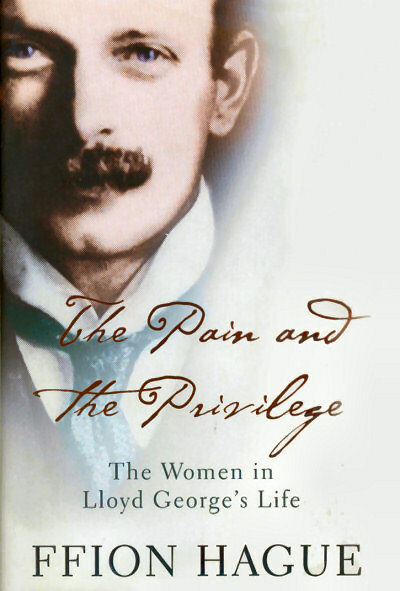 For the extraordinary women in Lloyd George’s life, theirs was indeed ‘the pain and the privilege of smoothing the path of a famous man’. A riveting narrative examination of the dynamic between a man, his mistress, his wife and his daughter. Played out behind the doors of Downing Street, it throws light on the depth of ambition of one of the 20th century's great political machinators…a fascinating story. Well-researched and thoughtfully written…she tells the story ably and entertainingly. Fluent, balanced and broadly sympathetic…where Hague does have both a new perspective and new material is in her treatment of Margaret Lloyd George, reclaiming Margaret as a significant political figure. Hague has given us a biography of Lloyd George himself in which a great deal of thought has gone into the business of what it was like to be him and what it was like to have him….a wise and measured assessment. An engaging portrait…an absorbing read. Hague has much to bring to the task of recovering their stories including her knowledge of the Welsh language and culture, an accessible style, and a sympathetic appreciation of "the pain and the privilege" of being married to a prominent politician…compelling. This well written and intelligent book…tells an involving, multifarious and often poignant tale. [This] well-researched and thoughtful portrait follows the triangular affair, often conducted under one roof, with rare empathy.